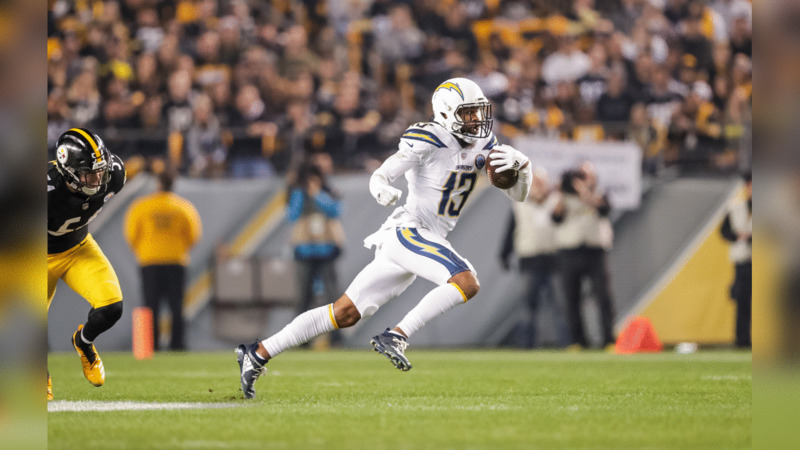 Keenan Allen runs after catching a pass from Philip Rivers during the Week 13 matchup against the Pittsburgh Steelers. Damion Square tackles James Conner during the Week 13 matchup against the Pittsburgh Steelers. 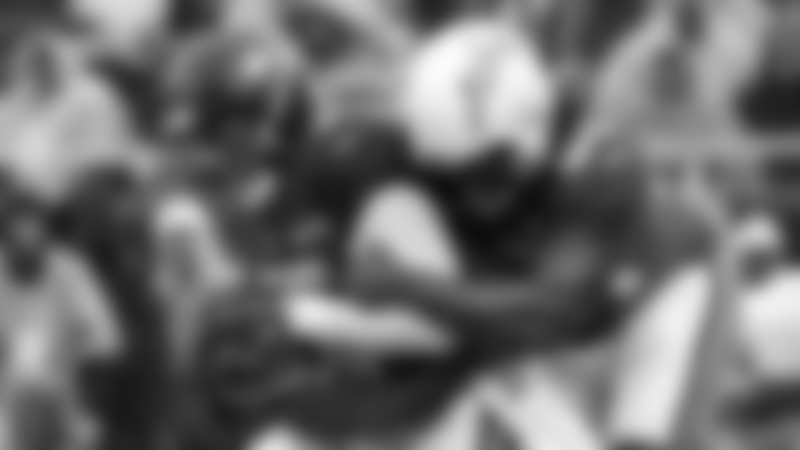 Derwin James tackles during the Week 13 matchup against the Pittsburgh Steelers. Travis Benjamin catches a pass from Philip Rivers during the Week 13 matchup against the Pittsburgh Steelers. Travis Benjamin runs after catching a pass from Philip Rivers during the Week 13 matchup against the Pittsburgh Steelers. Travis Benjamin dashes past Pittsburgh Steelers cornerback Mike Hilton on his way to a touchdown in the first half of an NFL football game, Sunday, Dec. 2, 2018, in Pittsburgh. Travis Benjamin and Justin Jackson celebrate Benjamin scoring a touchdown during the Week 13 matchup against the Pittsburgh Steelers. The Bolts celebrate Travis Benjamin's touchdown during the Week 13 matchup against the Pittsburgh Steelers. Derwin James runs after interception Ben Roethlisberger during the Week 13 matchup against the Pittsburgh Steelers. Derwin James intercepts the ball during the Week 13 matchup against the Pittsburgh Steelers. Tyrell Williams catches the ball during the Week 13 matchup against the Pittsburgh Steelers. Philip Rivers calls signals at the line during the Week 13 matchup against the Pittsburgh Steelers. Keenan Allen turns to run after catching a pass from Philip Rivers during the Week 13 matchup against the Pittsburgh Steelers. Philip Rivers turns to run during the Week 13 matchup against the Pittsburgh Steelers. Derwin James celebrates on the field during the Week 13 matchup against the Pittsburgh Steelers. Desmond King returns a kickoff during the Week 13 matchup against the Pittsburgh Steelers. Philip Rivers throws the ball during the Week 13 matchup against the Pittsburgh Steelers. Keenan Allen leaps to catch a pass from Philip Rivers during the Week 13 matchup against the Pittsburgh Steelers. Keenan Allen jumps up to catch a pass from Philip Rivers during the Week 13 matchup against the Pittsburgh Steelers. Keenan Allen celebrates on the field during the Week 13 matchup against the Pittsburgh Steelers. Philip Rivers throws the ball during the Week 13 matchup against the Pittsburgh Steelers at Heinz Field. Keenan Allen scores a touchdown during the Week 13 matchup against the Pittsburgh Steelers at Heinz Field. Keenan Allen leaps and scores a touchdown during week 13's matchup versus the Pittsburgh Steelers. Keenan Allen celebrates scoring a touchdown during the Week 13 matchup against the Pittsburgh Steelers at Heinz Field. Antonio Gates celebrates scoring a two-point conversion during the Week 13 matchup against the Pittsburgh Steelers at Heinz Field. Keenan Allen and Antonio Gates celebrate their scores during the Week 13 matchup against the Pittsburgh Steelers at Heinz Field. Desmond King returns a punt for a touchdown during the Week 13 matchup against the Pittsburgh Steelers at Heinz Field. Desmond King returns a punt for 73 yards and a touchdown during the Week 13 matchup against the Pittsburgh Steelers at Heinz Field. 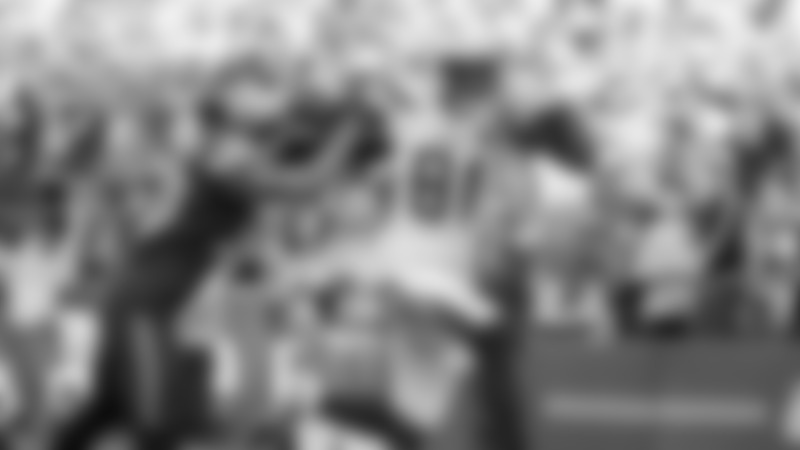 The Bolts pose for a picture after Desmond King's touchdown off a punt return during the Week 13 matchup against the Pittsburgh Steelers at Heinz Field. Justin Jackson runs downfield during the Week 13 matchup against the Pittsburgh Steelers at Heinz Field. Justin Jackson celebrates on the field during the Week 13 matchup against the Pittsburgh Steelers at Heinz Field. Justin Jackson runs in a touchdown during the Week 13 matchup against the Pittsburgh Steelers at Heinz Field. Justin Jackson celebrates scoring a touchdown during the Week 13 matchup against the Pittsburgh Steelers at Heinz Field. Justin Jackson celebrates after scoring a touchdown against the Pittsburgh Steelers in the second half of an NFL football game, Sunday, Dec. 2, 2018, in Pittsburgh. Justin Jackson and Dan Feeney celebrates Jackson's first NFL touchdown during the Week 13 matchup against the Pittsburgh Steelers at Heinz Field. Michael Davis tackles JuJu Smith-Schuster during the Week 13 matchup against the Pittsburgh Steelers at Heinz Field. Adrian Phillips tackles Vance McDonald during the Week 13 matchup against the Pittsburgh Steelers at Heinz Field. Brothers Derek and T.J. Watt pose for a post-game photo during Week 13's matchup versus the Pittsburgh Steelers. Twin brothers, Mike and Maurice Pouncey pose for a post-game photo during Week 13's matchup versus the Pittsburgh Steelers.